Eduardo Nunez rounds first base after hitting a three-run home run in the seventh inning. 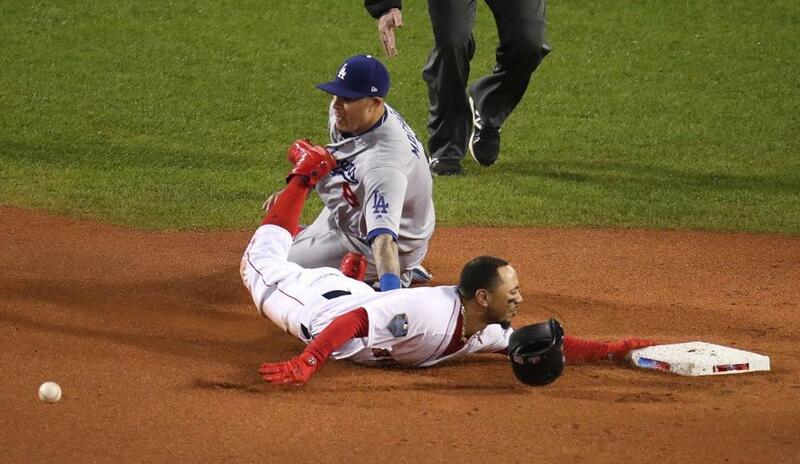 The Red Sox defeated the Los Angeles Dodgers, 8-4, on Tuesday night to take a 1-0 lead in the World Series. Here is Peter Abraham’s game story from Fenway Park. #RedSox 8, #Dodgers 4 in Game 1. The Red Sox are 8-2 this postseason and have won five straight. 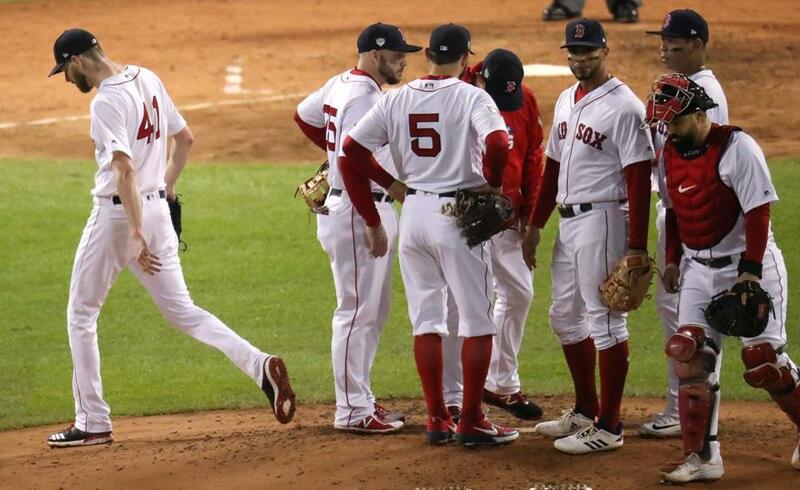 They are now 13-2 in World Series games since 2004, 7-1 at Fenway Park. Top: Craig Kimbrel came on to pitch for Boston and retired the side in order. Kimbrel blows 96 mph past Turner on the hands. 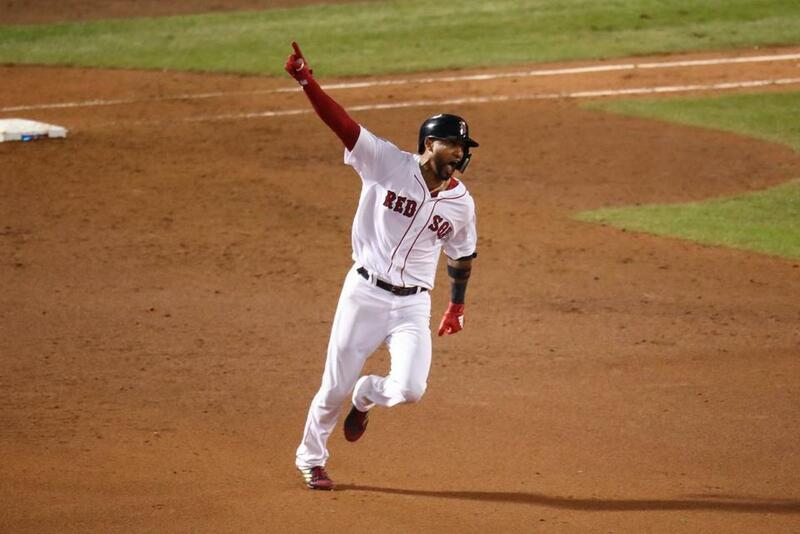 Red Sox go up, 1-0, in the World Series. The Game 1 winner has won 62 percent of all World Series, and 17 of the last 21 (81 percent). Bottom: Sandy Leon singled on a line drive to center field. Then Jackie Bradley Jr. and Mookie Betts struck out. Andrew Benintendi grounded out to second to end the inning. Top: Nathan Eovaldi replaced Rodriguez on the mound and retired the side in order. One of the quickest releases I?ve ever seen from Bogaerts, who makes a fine play in the hole for the 6-3. Eovaldi with a perfect eighth, as the Red Sox? starter/setup hybrids keep rolling. Bottom: Andrew Benintendi reached second after Joc Pederson couldn’t field a shallow fly ball to left field. Pedro Baez replaced Julio Urias on the mound. 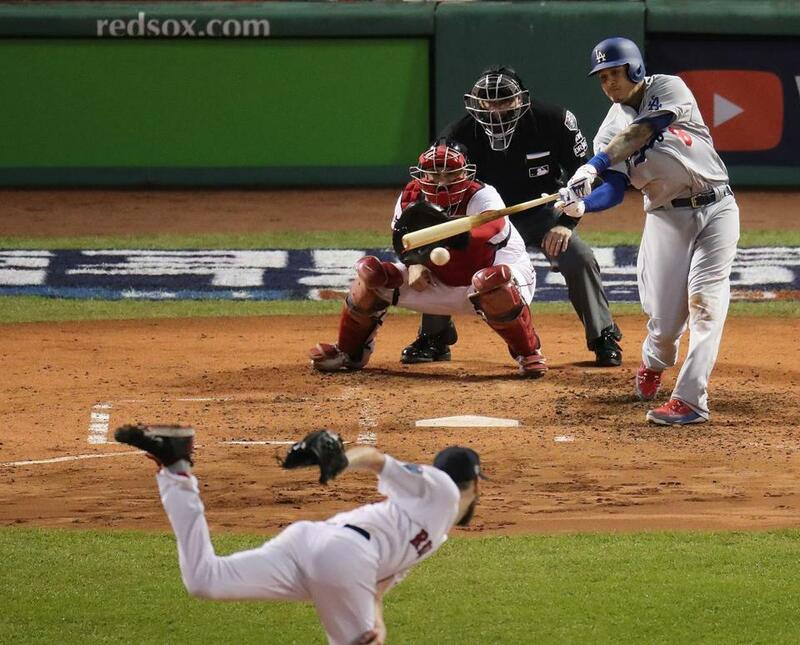 Baez then struck out Mitch Moreland, who was pinch-hitting for Steve Pearce. After Baez intentionally walked J.D. Martinez to put runners on first and second, Xander Bogaerts struck out swinging. Alex Wood replaced Baez on the mound. Pinch-hitting for Rafael Devers, Eduardo Nunez hit a three-run homer into the Green Monster. Ian Kinsler popped out to end the inning. 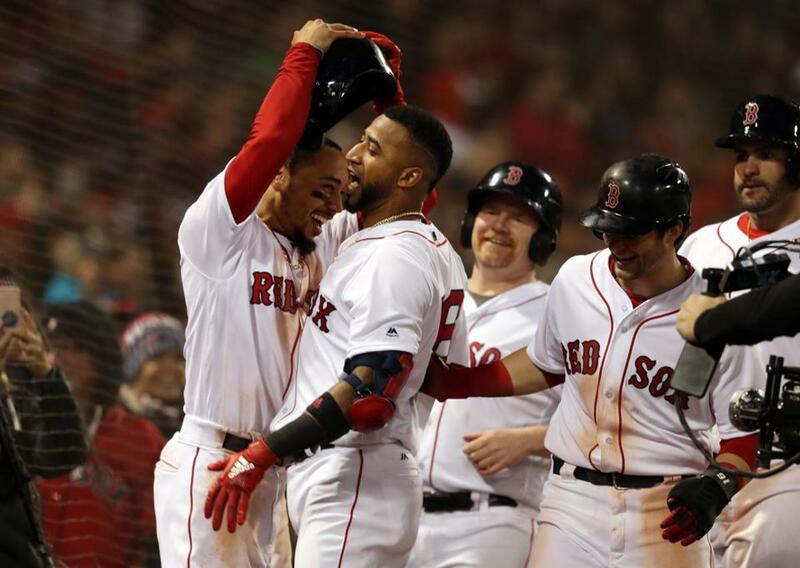 Mookie Betts celebrates with Eduardo Nunez after Nunez’s seventh-inning homer. One move after another, both managers playing the matchups. And it's forever gimpy Eduardo Nunez with the big hit. Benintendi is 4-for-4 with all four hits against lefties. Third Red Sox player ever with four hits in a WS game (Ellsbury, and Wally Moses). Top: Righthander Ryan Brasier replaced Joe Kelly on the mound. Pinch-hitting for Austin Barnes, Joc Pederson grounded out to open the inning. Pinch-hitting for Brian Dozier, Max Muncy worked a 3-2 count and ripped a single through the infield. Justin Turner got a base hit to put runners on first and second with one out. Pinch-hitting for David Freese, Yasmani Grandal walked to load the bases for Manny Machado, who hit a sacrifice fly to center. Muncy tagged to trim Boston’s lead to 5-4, and runners stayed at first and second. Eduardo Rodriguez replaced Brasier on the mound. Cody Bellinger popped out to end the inning. four-seamer at the top of the zone elicits a Eduardo Rodriguez falls behind 2-0 to Bellinger, but his ability to throw a fastball at the top of the zone elicits a pop-up. Sox are 6 outs from a 1-0 lead in the WS. Bottom: Lefthander Julio Urias replaced Ryan Madson on the mound. Sandy Leon struck out swinging before Jackie Bradley Jr. was called out on strikes. Mookie Betts popped out to first to end the inning. 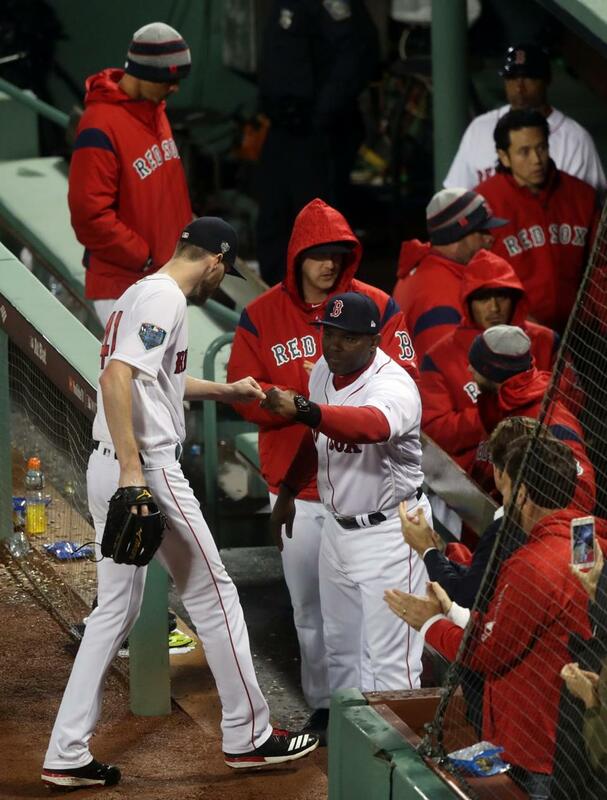 Top: Joe Kelly replaced Matt Barnes on the mound. Kelly retired the side in order, including back-to-back strikeouts to open the inning. In Yasiel Puig’s at-bat, Kelly’s pitches registered at 99.8, 100.1, 99.1, 99.9, and 98.8 miles per hour. 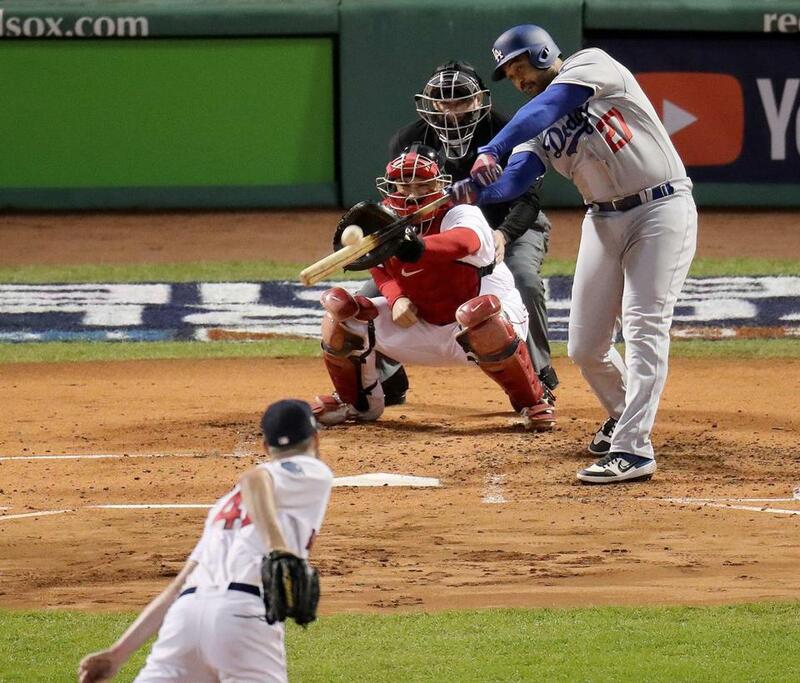 In NLCS G7, the Brewers made a dreadful mistake, a curveball in the bottom of he zone that Puig launched for a 3R HR. Kelly goes with 5 straight fastballs for the weak groundout. The final one wasn?t very well located, but 99 mph beat Puig to the spot. Joe Kelly threw 14 pitches in the sixth, 11 for strikes. 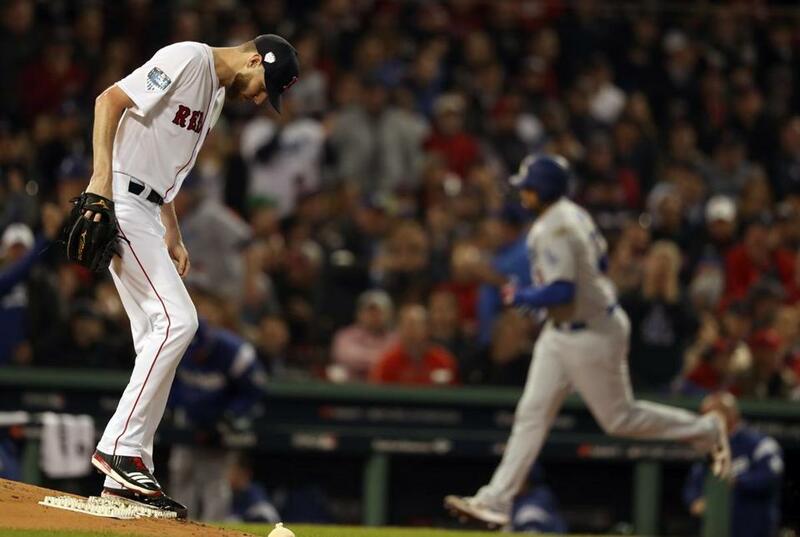 Bottom: Clayton Kershaw walked Mookie Betts on nine pitches, Andrew Benintendi singled on a line drive to left field, and then Dodgers manager Dave Roberts pulled Kershaw. Ryan Madson took the mound for LA. Madon’s second pitch bounced in front of home plate and got by catcher Austin Barnes, allowing Betts and Benintendi to advance to second and third. Madson walked Steve Pearce on four pitches to load the bases. J.D. Martinez then struck out swinging for the first out of the inning. 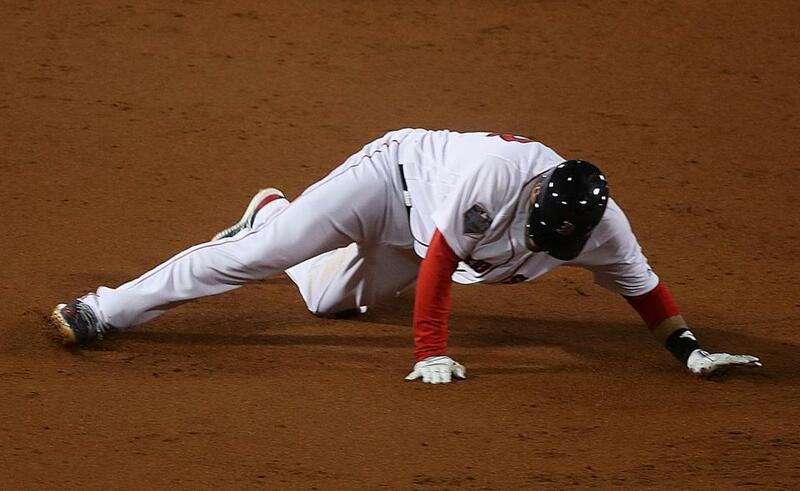 Xander Bogaerts hit a bouncing ball to short, but the Dodgers couldn’t turn the double play. Betts scored, Benintendi advanced to third, Pearce was thrown out at second, and Bogaerts was safe at first. With runners on the corners, Rafael Devers singled past a diving Dozier. Benintendi scored to extend Boston’s lead to 5-3. Kinsler lined out to end the inning. Top: Matt Barnes started warming in the Sox bullpen. Chris Sale issued a lead-off walk to Brian Dozier and was pulled by manager Alex Cora. Barnes replaced him on the mound. On Barnes’s second pitch, Justin Turner muscled a grounder past Rafael Devers to put runners on first and second. David Freese then struck out swinging for the first out of the inning. The two runners advanced to second and third after Barnes’s second pitch to Manny Machado got away from Leon. Machado then grounded out, but scored Dozier to tie it at 3-3. Pinch-hitting for Chris Taylor, Cody Bellinger popped out to end the inning. The wild pitch proves immensely costly, as it took away the DP and allowed Dozier to score from 3rd. Tie game, and Sale gets a no-decision in which he showed better power than in the ALCS but still lacked the fastball to dominate. Matt Barnes has entered games in the 5th (twice), 6th (twice), 7th (three times) and 8th this postseason. "In the regular season, I would go out to the bullpen in the 4th or 5th inning. Now I'm out there when it starts." Seems like Cora wanted Sale vs Dozier as opposed to Barnes (or Eovaldi) against a lefty (Muncy, Bellinger, Pederson). But with Barnes on, after Turner, it's probably time for what Cora called the Dodgers' second shift. Sale at 86 pitches and Barnes getting warmed up as the 5th inning starts. 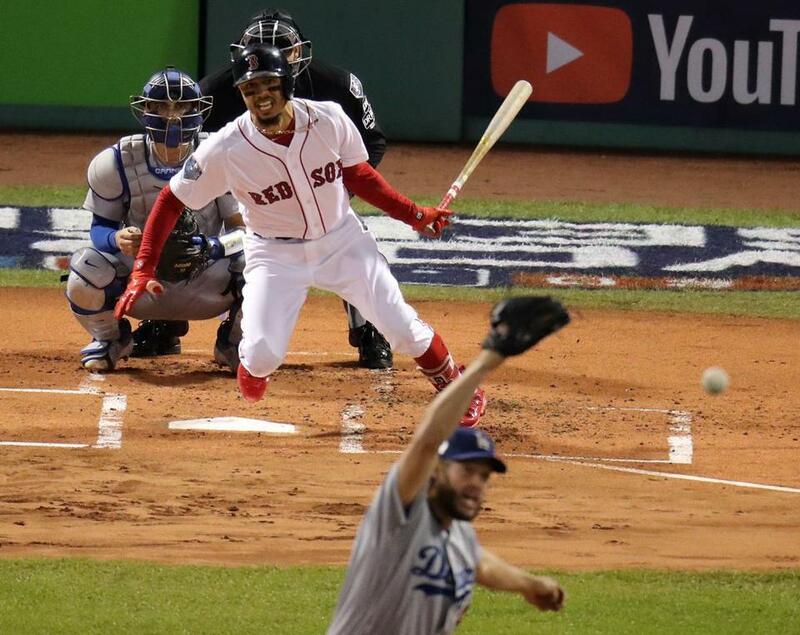 Bottom: Clayton Kershaw retired the side in order, striking out Ian Kinsler and Sandy Leon before Jackie Bradley Jr. grounded out to first to end the inning. Top: Chris Sale opened the inning by striking out Enrique Hernandez and Yasiel Puig, Sale’s sixth and seventh Ks of the night. Austin Barnes then lined out to center to end the frame. Sale concluded his 2nd time through the order with 86 pitches through 4 innings. Eovaldi warming. And now Eovaldi is no longer warming. Perhaps Sale negotiated his way to the 5th. Bottom: After Mookie Betts struck out swinging to open the inning, a blooper from Andrew Benintendi dropped in front of Chris Taylor in left field. The ball got past Taylor, but Benintendi was held at first. Steve Pearce hit a grounder to the Manny Machado, who started the 6-4-3 double play to end the inning. The Red Sox challenged the out call at first, however, and Pearce was ruled safe after replay review. J.D. Martinez then hit a high fly ball off the center field wall to drive in Pearce, giving Boston a 3-2 lead. As he was rounding second, Martinez slipped on the bag and appeared to tweak his ankle. He stayed in the game. Then Rafael Devers struck out swinging to end the inning. Clayton Kershaw’s pitch count: 56, 36 for strikes. J.D. Martinez slipped while running the bases after his double in the third. A trainer looked at Martinez after he slipped. Martinez wiped out rounding second on his RBI double, and he's now being checked by the trainer. Amidst chants of "J.D., J.D." at Fenway, he's testing it with some light jogging. He'll stay in. Top: After Brian Dozier flew out to left field, Justin Turner singled to right field. David Freese’s liner to left dropped in front of Andrew Benintendi for a base hit to put runners on first and second. Manny Machado then grounded a base hit to left, driving in Turner to even the score at 2-2. With runners on first and second, Chris Taylor struck out looking and Matt Kemp grounded out to end the inning. Chris Sale has struck out five and is at 72 pitches through three. Manny Machado hit an RBI single in the third inning. The Dodgers lineup is deeper than it's typically given credit - they had an OPS+ that was at least 14 percent better than average at all but two positions. Game tied, 2-2. Bottom: Clayton Kershaw walked Rafael Devers on five pitches. After Ian Kinsler struck out swinging, Sandy Leon earned his first hit of the postseason with a single to right field. Devers advanced to third. Jackie Bradley Jr.’s hard-hit ball up the middle deflected off of Kershaw’s foot, and Manny Machado was able to turn a double play to end the inning. Bradley 104 mph the middle, destined for center field. Ball takes a weird hop off the mound and its a double play instead. Sox 2-1 after 2. Five of the first nine reached on Kershaw. 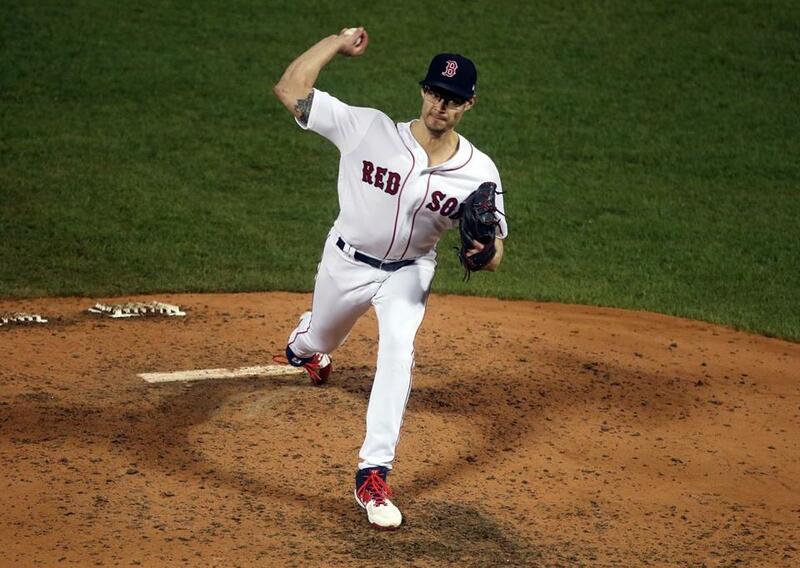 Top: Chris Sale struck out Chris Taylor to start the inning — Sale’s third of the night. After working an eight-pitch at-bat, Matt Kemp then launched a homer into the Green Monster to pull the Dodgers within one. Kemp’s blast had an exit velocity of 101 miles per hour and traveled a projected 389 feet. After Enrique Hernandez grounded out, Sale walked Yasiel Puig on seven pitches. Austin Barnes struck out swinging to end the inning. Sale’s pitch count: 51, 30 for strikes. Matt Kemp hitting his solo homer in the second. Chris Sale looks down as Matt Kemp rounds the bases after his solo shot. Bottom: Mookie Betts singled to center field to open the inning. On the next pitch, Betts stole second. Andrew Benintendi then hit a grounder past a diving Dozier to drive in Betts. Benintendi reached second on the base hit. The Dodgers challenged the safe call, but it was upheld. Steve Pearce flied out to shallow right for the first out of the inning. J.D. Martinez singled left-center to drive in Benintendi, giving the Red Sox a 2-0 lead. 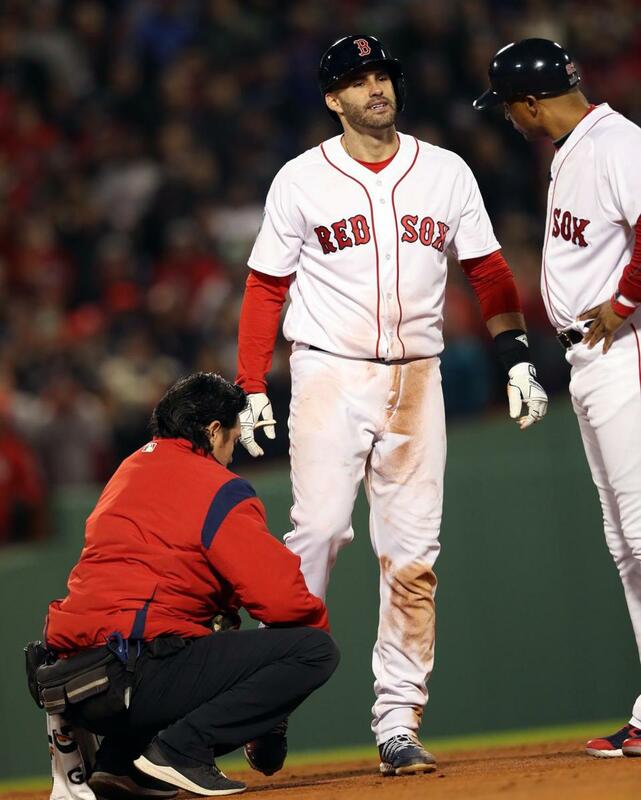 During Xander Bogaerts’s at-bat, Martinez was thrown out at second after taking off too early from first. Bogaerts then popped out to first base to end the inning. Kershaw’s pitch count: 20, 13 for strikes. All three Red Sox hits were on sliders. The Red Sox saw 10 sliders and swung at 7 (two of the takes were balls). Kershaw's being aggressive in and around the strike zone with it, with little velo variation from his fastball, and the Sox seem to be hunting it. That was textbook. Betts singles, steals second, scores on Benintendi's single and Benintendi takes second on the ill-advised heave to the plate by Puig. Dodgers can't give away 90 feet like that. 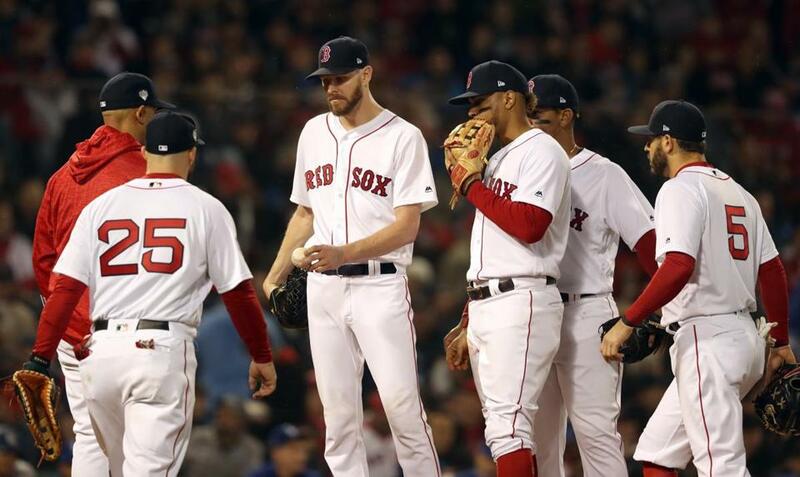 Top: Lefty Chris Sale started his night with back-to-back strikeouts of Brian Dozier and Justin Turner. David Freese then singled to right field. Manny Machado flied out to left field to end the inning. Sale’s pitch count: 21, 13 strikes. His pitch velocity reached 96 miles per hour. Sale's fastball averaged 94.2 mph in the first inning, up from 92.0 in his G1 start of the ALCS. He had two swings and misses on sliders in the first; he had a total of four in the ALCS start. That Sale has his slider right off is a good sign for the Sox considering how long it took him to find it in Game 1 of the ALCS. Last start, Sale had no feel for his slider until the end of the 3rd inning. Here, he lands an 80 mph Snitch for a swing-and-miss, and his second K.
Sale?s first pitch listed at 94, followed by 92. Looked like a front door 94 mph two-seamer from Sale to K Dozier. Obviously, that?s velo he didn?t have last start. Loud ovation for Dave Roberts at Fenway Park. Very cool to see that. 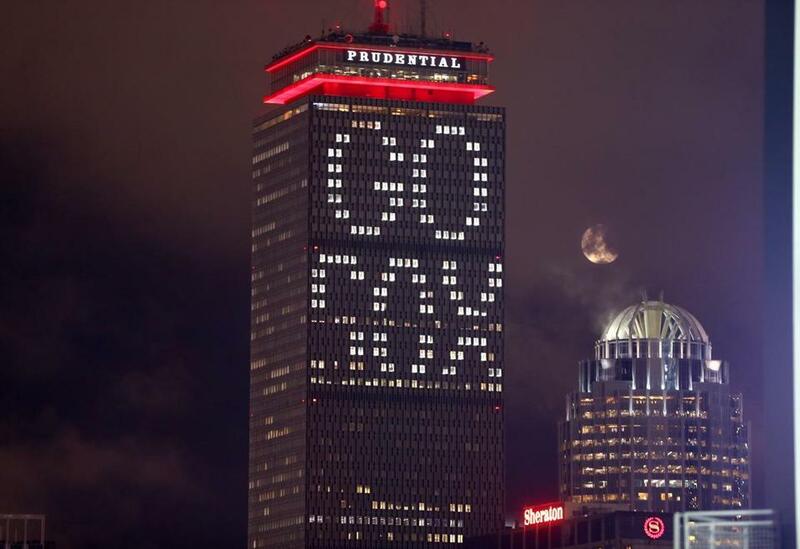 The Prudential Building is lit up supporting the Red Sox. 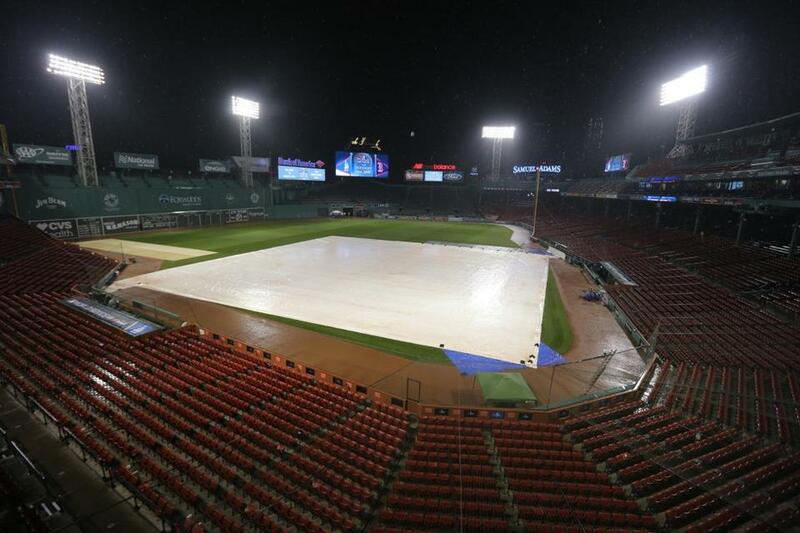 ■ The rain stopped at Fenway Park and the grounds crew removed the tarp in the 7 o’clock hour. There is a #tarpaulin removal at Fenway, the rain has stopped, and fans are filtering to their seats. The temperature was 49 degrees at game time and will drop into the mid-40s as the game progresses. The infield tarp covers the field as a storm passes over Fenway Park before the game. Fans were instructed to take cover as a storm moved through the area. 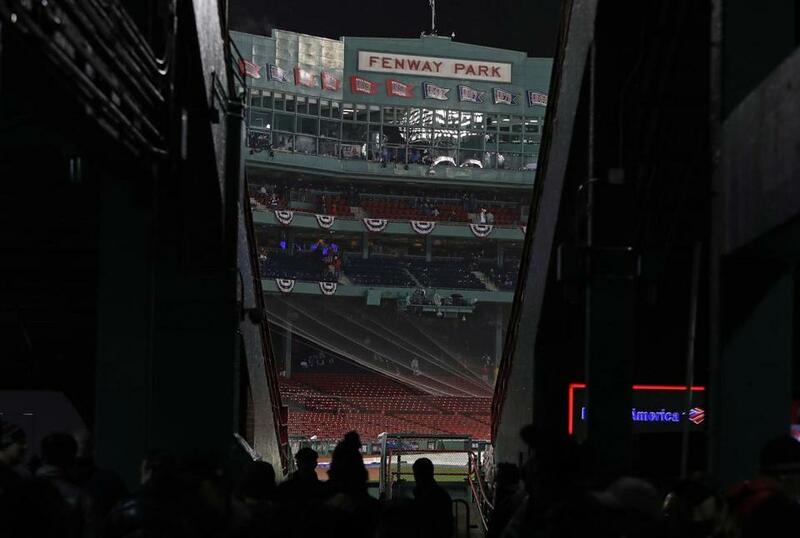 Scoreboard at Fenway Park warning fans to take cover in the concourse or under the grandstands immediately because of "severe weather in the area." Alex Speier wrote about how players handle the cold and how it might affect hitters and control for pitchers. ■ Bill Belichick narrated the Fox’s hype video that aired ahead of Game 1. "It was great to be a part of that, I?m not really as much of a baseball background but the World Series is one of the great sporting events in this country and has great tradition to it, especially with these two franchises." "Through the years, the players have changed ? but the goal has not." 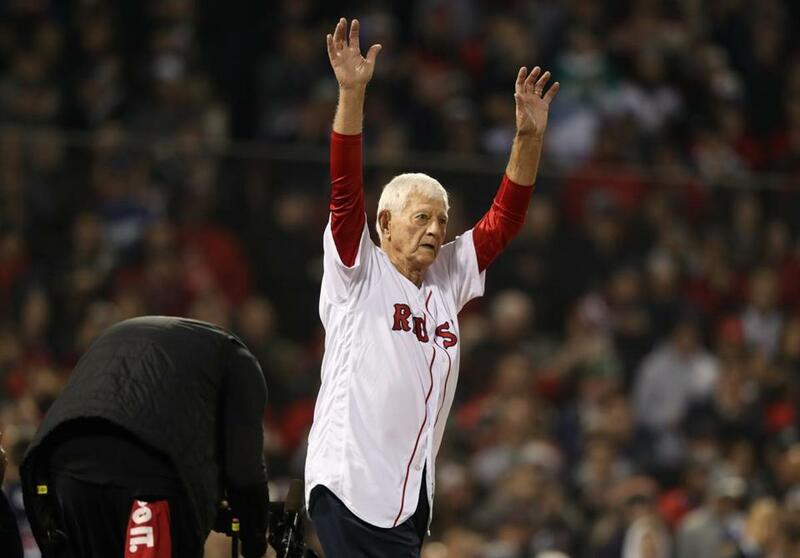 ■ Carl Yastrzemski threw out the ceremonial first pitch. ■ James Taylor sang the national anthem. ■ David Ortiz, working the World Series for Fox, is back at Fenway and chatted with Mookie Betts this afternoon. 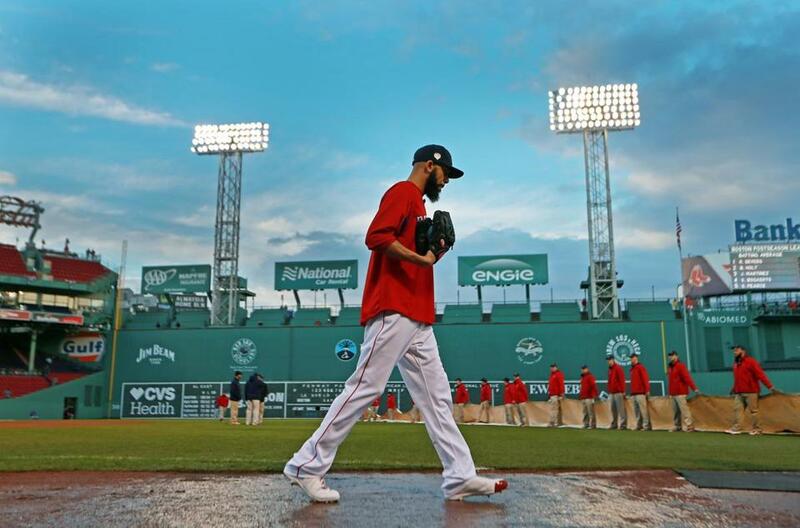 After a rain storm moved through the area, David Price walked on the wet dirt, while in the backround, the grounds crew, who had removed the tarp to clear it of standing water, were ready to put it back on over the infield. Ran into Magic Johnson, one of the Dodgers owners, at Fenway. "All these years coming to Boston to play and this is my first time here," he said. 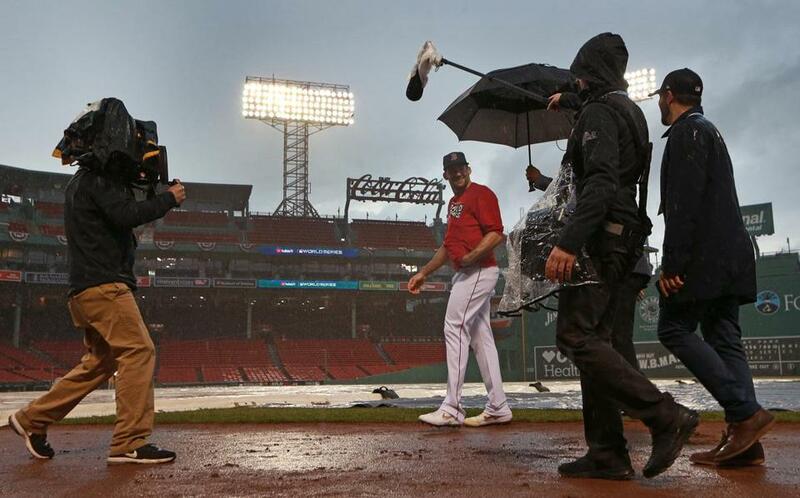 Red Sox pitcher Nathan Eovaldi is shadowed by an umbrella-toting camera crew as heavy rain fell at Fenway Park at about 4:30 p.m.
Alex Cora said 25 family members are attending the Series. ?Getting expensive ? he cracked. His mom came from Puerto Rico for the first time in the postseason. Cora suggested it was unlikely Mookie Betts would play second base in LA because they value his glove in the OF. Maybe so. But it could a little dodge. Saying Betts would or even could only makes it a bigger deal and generates more questions. ■ LHP Chris Sale (1-0, 3.48 postseason) and LHP Clayton Kershaw (2-1, 2.37 postseason) are the starters. ■ Among active pitchers, the 30-year-old Kershaw has the lowest earned run average at 2.39. The 29-year-old Sale is second at 2.89. They faced each other one previous time, on June 15, 2012 at Dodger Stadium. Neither pitched well. Sale allowed five earned runs over 5.2 innings and Sale four over six. The Dodgers beat the White Sox, 7-6. Here is Abraham’s full game preview with more notes and nuggets. Pitchers (11): RHP Matt Barnes, RHP Ryan Brasier, RHP Nathan Eovaldi, RHP Heath Hembree, RHP Joe Kelly, RHP Craig Kimbrel, LHP Drew Pomeranz, RHP Rick Porcello, LHP David Price, LHP Eduardo Rodriguez, LHP Chris Sale. Cora on Pomeranz: With Dodgers lefties, ?it?s like playing hockey - all the shifts.? Cora says experience of last year with Astros vs Dodgers showed significance of LHPs (he cites Liriano vs Bellinger). Velo is 93 in side sessions. ?We?d been looking for that the whole season.? Cora said the choice of Pomeranz was based on the Dodgers lefties and their righties with reverse splits. Pomeranz has popped his velocity up and they feel he can get a big out. His curveball plays. Catchers (3): Sandy Leon, Blake Swihart, Christian Vazquez. Infielders (7): Xander Bogaerts, Rafael Devers, Brock Holt, Ian Kinsler, Mitch Moreland, Eduardo Nunez, Steve Pearce. Outfielders (4): Andrew Benintendi, Mookie Betts, Jackie Bradley Jr., J.D. Martinez. Pitchers (12): LHP Scott Alexander, RHP Pedro Baez, RHP Walker Buehler, RHP Dylan Floro, LHP Rich Hill, RHP Kenley Jansen, LHP Clayton Kershaw, RHP Ryan Madson, RHP Kenta Maeda, LHP Hyun-Jin Ryu, LHP Julio Urias, LHP Alex Wood. Catchers (2): Austin Barnes, Yasmani Grandal. Infielders (6): Brian Dozier, David Freese, Enrique Hernandez, Manny Machado, Max Muncy, Justin Turner. Outfielders (5): Cody Bellinger, Matt Kemp, Joc Pederson, Yasiel Puig, Chris Taylor.